Qualified leads to fuel your pipeline and drive revenue growth. We leverage science, technology, and proven marketing methods to help you realize your customer acquisition and revenue goals. To target and connect with qualified prospects, we use predictive targeting coupled with a multi-channel, portfolio approach. Lead Generation. Targeting and engaging. 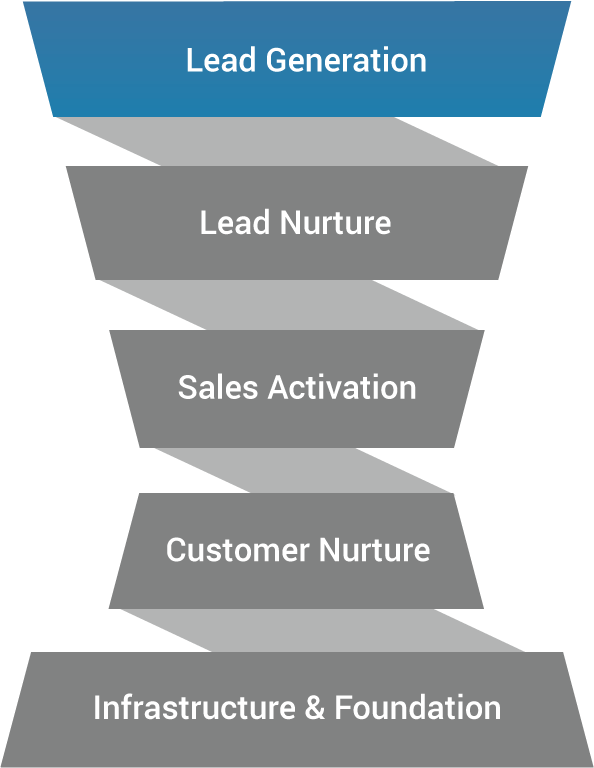 Lead Generation is how you fill your marketing and sales pipeline with targeted, qualified leads. Typically, Lead Generation programs align with the Awareness and Discovery stage of the prospect’s buying journey. That’s when your prospects are deciding if they should make a change and invest the time and money to fix a problem or take advantage of an opportunity. Today’s buyers are demanding and skilled. Buyers today are self-directed, multi-channel, mobile, social and skilled at ignoring irrelevant messages, ads, and offers. That’s why traditional and online lead generation methods often fail. Buying lists, cold calling, irrelevant online ads, weak content, and ineffective offers can not only fail, but also potentially damage your brand and reputation. What it takes to connect and influence. Modern and effective Lead Generation programs engage your target audience in the channels and formats they prefer with compelling content, offers, promotions and other calls to action that truly connect with them and their needs, wants, and desires. In the process of aiming to meet their needs, you earn the right to become a part of their buying journey, while helping them solve their problem while influencing their buying decision. 86% of marketing professionals agree that successfully integrating multiple channels under a single marketing strategy is crucial to their long-term success. Lead Generation solutions from BIG IDEA. We start with a deep understanding of your target audience: their needs, challenges, goals, emotional drivers, buying process, important areas of interest, and the most effective media channels to reach them. We identify intersections between the unique value proposition of your offer and the needs, wants, and desires of your target audience. Integrated marketing grounded in best practices. We’ve learned the best way to fill your marketing and sales pipeline with high-quality leads is through an integrated program grounded in following best practices. We leverage science, technology, and proven marketing methods to help you realize your customer acquisition and revenue goals. Permission-based. Bringing them to you. Don’t waste time and money buying cold, stale lists and call them “leads.” It takes a smart plan, persistence and patience to generate a truly qualified, opt-in lead that is engaged with your offer. This approach will yield a substantial payback throughout the rest of your integrated demand generation program. Channel agnostic and effective across devices. Reaching your audience today means your marketing needs to be present and effective across devices and across multiple channels. Prospects and customer dictates the most effective channels, whether that’s traditional or digital. Using predictive targeting and attribution tracking, we are able to zero-in on where, exactly, to find the most qualified prospects. Predictive technology, data science, and analytics, coupled with best practices allows us to target prospects those most like your best customers and with the highest likelihood of becoming new buyers sooner. Today’s buyers use multiple devices across an array of channels. This is why you need to leverage a mixture of inbound and outbound tactics across paid, earned and owned media channels that reach prospects across multiple devices. And it all needs to be coordinated, tracked, and optimized to maximize your marketing ROI and your results. Be Relevant. Or be ignored. We speak to your targeted buyer’s specific needs, wants, and desires with messaging, creative, content, offers and calls to action that attract, engage, and result in a response. Marketing and sales success is a destination and getting there is an iterative process. With lead generation, it’s best to start small and scale up what works. Start with small bets, measure and assess, and let the results from the data direct you as you refine the offer, creative, and media decisions. Once the lead is generated, automatically evaluate and score them then route the qualified leads in active buying mode directly to sales. Leads who are not yet ready to engage with a sales person are routed into a Lead Nurturing Program.